Who ever goes to the beach with thoughts of remodeling it? What can be invented by the human cyborg that can heighten the phenomenological potency of a biome whose very asset is associated with its unadulterated state? Why set out to further tame the palm tree beyond the decorative and into becoming a domestic appliance? These are some of the questions that come to mind when contemplating the artwork titled Difusores para palmas/PalmShade (2012) [Figure 1], by Puerto Rican artist Marxz Rosado. He was one of the artists invited to the eleventh edition of the Havana Biennial, which was held from May 11 to June 11, 2012. Rosado is a sculptor, designer, and professor at the Escuela de Artes Plásticas de San Juan, Puerto Rico, and has been responsible for a number of national and international exhibitions, each of which highlight his tendency towards deploying jocose tropes and polysemous discourse markers. He is recognized for his treatment of social spaces from a perspective consistent with the social reality that he observes and which surrounds him instead of fomenting fictions for tourists, which happens often in the context of the Caribbean. Also, this artist’s production is not confined to a single way of making, but springs from of an allocution supported by an assortment of manifestations, like videography, sculpture, installation, drawing, and furniture design. Through this multimedia approach, Marxz Rosado’s practice tackles the logic behind myths about modernism, and how art can serve to underscore its failures. The genesis of PalmShade can be pinned to a specific moment, namely the first time Rosado visited the neighboring island. “I first went to Cuba in 1994, and there I encountered often what we call in Puerto Rico an apagón (black-out)… That is how PalmShade was imagined,” Rosado reveals in interview. He continues by asking a compelling question, “What good is progress if it makes a society de-evolve and slows their possibility of expansion?” The Cuban government has absolute control over the way of life in the island, and that fact, in combination with the trade blockade to Cuba by the United States, has the country living in socioeconomic stagnation. The propaganda from the state commands the people to stand together against the effects of the blockade and to keep on what has increasingly become a poker face to the world. In addition to keeping this pretense, the Cuban residents live in a country full of police checkpoints, where the local officials exercise their right to search and seize any property that they deem suspicious or illegal (mainly for food items), and in certain instances separating the local population from the tourists in possible zones of contact with the outside world. 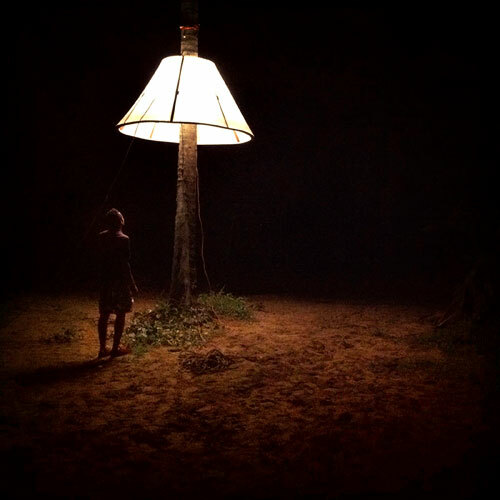 Under the common denominator of Artistic and Social Imaginary Practices, the title and theme for the 11th Havana Biennial, Marxz Rosado creates lampshades for palm trees, an artifact that recognizes the possibilities of unorthodox approaches to such practices as public sculpture and public art. 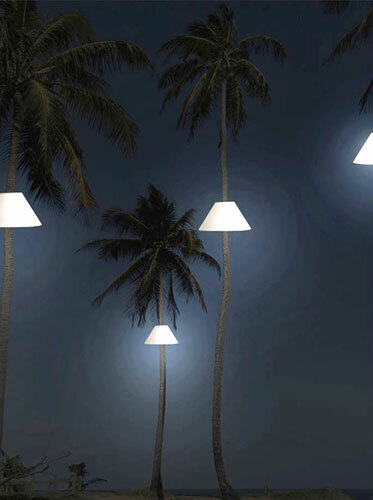 These conceptual design works act as an invitation to gather under the palm trees at night, very much in the same manner that the cool shade that the palm tree provides during the day acts as an invitation to gather beneath. 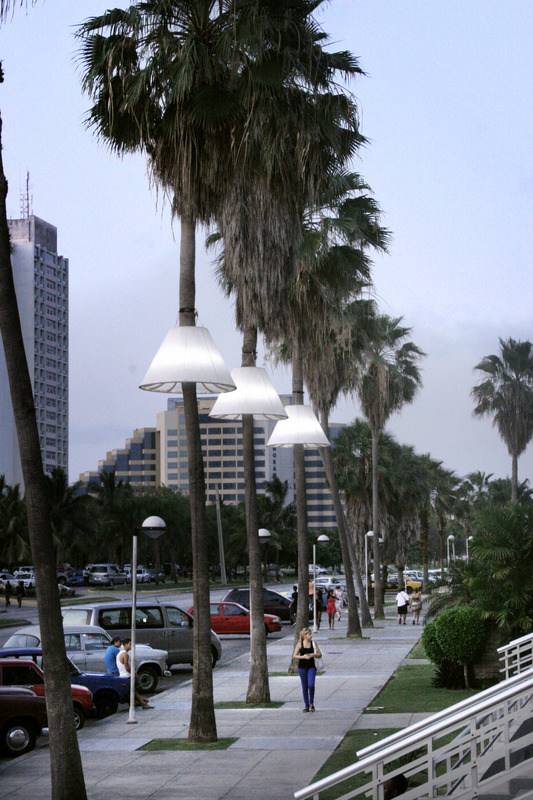 A beach with palm trees that have been outfitted with Rosado’s PalmShades can continue to serve as sites for social interaction well after sunset, enabling a safe zone of social contact and allowing for family celebrations or other social gatherings that begin during the day to continue into the night [Figure2]. Marxz Rosado designed the sculptural element of PalmShade to be connected either to the electric grid or to a set of batteries. If these works were to be considered as public art work, they could be made to power themselves by installing photovoltaic cells that could collect solar energy during the day. They could also be modified to use LED lights instead of halogen lamps. The design presented in the Biennial could transition into a context of commercial production and thus make a transition from a unique work of conceptual art to become an object that could be mass-produced and integrated into the grammar of landscape architecture and urban design [Figure 3]. One can imagine them along the beaches of Ipanema in Rio de Janeiro, Brazil, along the beach of the Escambrón in San Juan, Puerto Rico, in South Beach, Florida, or perhaps in new palms that could be grown along the very beaches of Havana, near the Malecón. Another site where one can imagine these beautiful light sculptures is on the palms in Dolores Park, in San Francisco, California, where there is a strong and vibrant culture of using the park for socialization by the citizens of all of San Francisco. I discussed possible modifications to the concept of PalmShade that could make it successful as a mass-produced object; the distance between the version presented by Rosado, primarily a work of conceptual art, and the seamless stylization it would require to become a competitive product in the market represents an important distance to reflect upon. By this, I do not mean to criticize the approach taken by Rosado, but seek to point out the complex relationship between art and industrial design as they are imbricated in the practice of this artist. He operates in what one could categorize as an in-between frequency, or an interdisciplinary space where the artist can freely experiment with the freedoms and tools available to both practices, and producing artworks that exist in a state of semiotic flux. They can be seen as utilitarian and also be completely poetic. El hombre de Islote (The man from Islote) (2009), another work by Marxz Rosado, is also presented at the Cuenca Biennial, at a gallery named Espacio Vacío, also in Guayaquil. Islote is an actual place in Arecibo, a town along the northern coast of Puerto Rico, and the video work by Rosado is a mock ethnographic portrait of a notoriously eccentric man that hangs around in that location. The actor central to this video work is a product of an almost cinema verité interplay between him and Rosado, whose cues raise questions regarding the making of a city, and issues regarding human/machine relationality. The Havana Biennial was inaugurated in 1984, but it wasn’t until its second installment in 1986 that its scope was broadened to include the largest selections of art from around the world. On the second iteration of the Havana Biennial, the Cuban curator Gerardo Mosquera wrote, “The art world has changed quite a lot since 1986, when the 2nd Havana Biennial held the first truly international exhibition of contemporary art, gathering 690 artists from 57 countries and pioneering the extraordinary internationalization of art we witness today[iv].” This broad selection was restricted to the countries under the rubric of “Third World,” including artists from Latin America, Africa, and Asia. It wasn’t until the 10th installment of the Biennial in the year 2009 that this restriction was lifted and the event became truly global. Puerto Rico has been part of the Biennial’s development since the first installment, which only focused on the art of Latin America and the Caribbean. The shift of focus from the Latin American contemporary art scene to the Third World followed by a turn to the global marked a shift for all countries involved, for it raised them to the status of international players in a new exhibitionary paradigm: having different countries / regions showing innovation and leadership in different ways, and thus being on the same playing field but with different strengths. This experiment spearheaded by Cuban cultural agents like Noceda, Herrera-Ysla, and Mosquera helped cement the biennial as a tool for political transformation, as it has generated confidence in the belief that biennials can play an instrumental role in transforming intellectual dialogue about art and life across geopolitical borders. This promise requires acknowledging the hurdles that it simultaneously raises. Marxz Rosado’s participation in the 2012 Havana Biennial was a source of national pride in Puerto Rico, and it speaks to his development as an artist, keeping close always to the conversation about contemporary Latin American art and its institutions. Rosado admittedly has very little contact with the US art scene, but not for any particular political position. He remains open to more international participation, and is very active in the Latin American art circuit, where he continues to represent Puerto Rico in his trademark style of fusion between art and design. The theme Artistic and Social Imaginary Practices, explored in the 11th installment of this historically relevant biennial, helps unpack the existing relationships between art and the notion of the social imaginary, a concept from the field of social sciences. There exists an interplay in the matrix of this exhibition, which is not without its caveats and hedges, and which speaks to the contemporary moment and the struggle to achieve the perfect biennial. Canadian philosopher Charles Taylor states, “In our day, the problem needs to be posed again from a new angle: is there a single phenomenon here, or do we need to speak rather of ‘multiple modernities,’ the plural reflecting the fact that other non-Western cultures have modernized in their own way, and cannot properly be understood of we try to grasp them in a general theory which was originally designed with the Western case in mind?”The curators of the Havana Biennial wanted to explore the intersection between art and ideas about the utopian, or dystopian, impulse behind contemporary art practitioners. Many like Rosado also weave ideas of alternative modernities into their work, or report on the fallout left in the wake of definition that have either failed or have not stood the test of time. This interrogation, and to a certain degree prosecution, of modernity is the source of many interesting experiments, presented in galleries and museums across the world as sociopolitical critique. Sometimes the critique takes an obvious form, but sometimes it takes a different position. 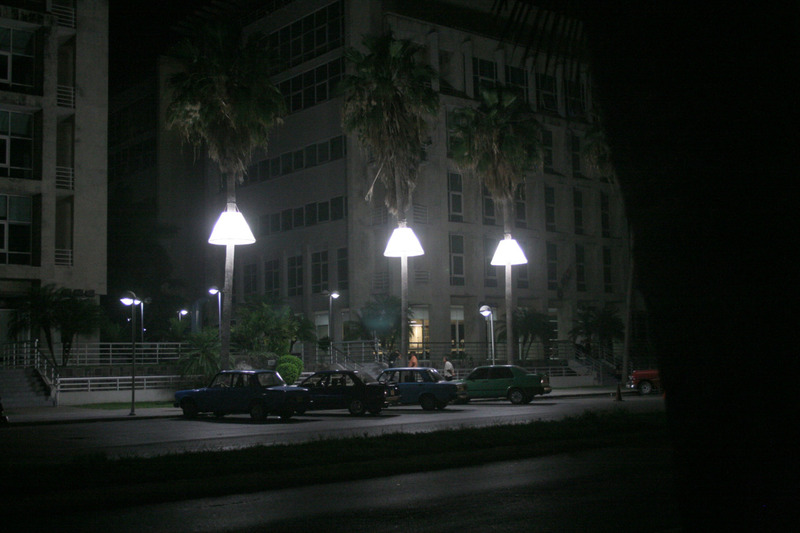 Rosado stated that he was inspired to make PalmShade when he went to Cuba in 1994 and experienced a blackout. The work he presented in the biennial in Cuba required it to be powered by the grid, making any occurrence of a blackout a public event, instead of something experienced in private or the context of the home. From everywhere one would be able to tell if the city has electricity that night or not. With the installment of these objects, Rosado creates a marker that would act as a way of highlighting the frequency of power outages in the city of Havana. Art operates in this sense sometimes, stating a powerful message by failing in such a way that the often-contradictory logic behind myths about modernism becomes visible.